Northern flicker woodpeckers come in two color schemes, depending on where they’re from. Although all the birds are brown and black on top, the subspecies that lives in western North America—the red-shafted flicker—has red feathers on the underside of its wings and tail. Its cousin from the eastern side of the continent, the yellow-shafted flicker, has—you guessed it—yellow feathers in those spots. Seems simple enough, but scientists estimate that nearly one-third of yellow-shafted flickers also have orange or red feathers, and odd-colored woodpeckers are found far east of where the two subspecies overlap, potentially producing hybrids. More and more flickers are red where they shouldn’t be, in more ways than one. A team of researchers has a new explanation for this color shift: Invasive plants are altering the woodpeckers’ palate—and, as a result, their palette. In short, they're eating things that are changing their colors. Previously, some scientists had speculated that there was a factor selecting for red feathers, pushing the yellow-shafted flickers to evolve to look more like the red-shafted ones. Others suggested that the flickers were genetically capable of developing either color, and sometimes birds just grew feathers in the wrong shade. But ornithologist Jocelyn Hudon, of the Royal Alberta Museum in Ontario, thought something else was responsible. A miscolored bird’s feathers, he noticed, can differ in shade from one year to the next. Other east coast birds that normally have yellow feathers—like cedar waxwings and Baltimore orioles—also sometimes have orange or red feathers. Maybe, Hudon, thought, something the birds were eating was causing these color changes. That's how flamingos get their color. 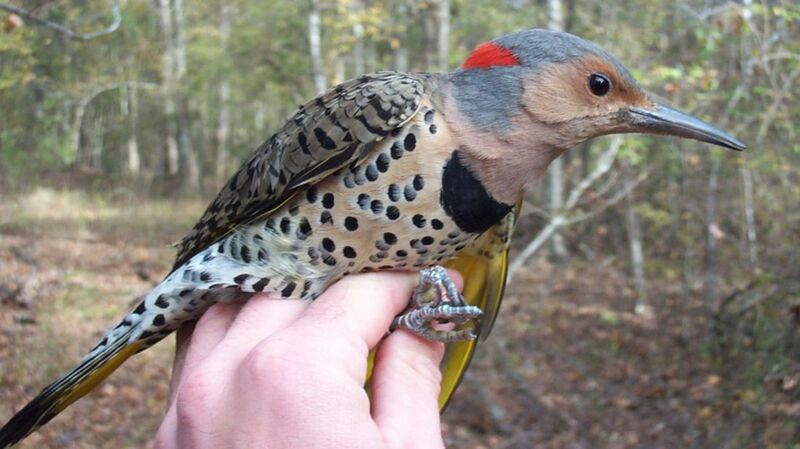 To find out, Hudon and his colleagues analyzed the "aberrant" feathers on a few yellow-shafted flickers they captured in Massachusetts and Pennsylvania, and compared them to museum specimens of yellow-shafted, red-shafted, and hybrid flickers collected across Canada. As they explain in an upcoming paper in the journal The Auk: Ornithological Advances, they found that the yellow-shafted flickers’ red feathers weren’t colored by the same carotenoid pigments responsible for the colors of red-shafted flickers, but by a pigment called rhodoxanthin. Data from birders that had banded and tracked hundreds of flickers over the last 30 years told the scientists that the birds acquire the red pigment and shift colors during their fall molt in August and September, a time of year that the flickers mix fruit into their ant-based diet. That led Hudon to the likeliest source of the rhodoxanthin: Tatarian and Morrow’s honeysuckles, a pair of invasive plants native to Central Asia that produce abundant berries loaded with rhodoxanthin right around the time of the flickers’ molt. The berry theory would explain why the red yellow-shafted flickers don’t display any traits of red-shafted flickers beyond feather color (there’s no hybridization); why many yellow-shafted flickers have both red and yellow feathers (the rhodoxanthin only affects feather growth after berries are eaten); and finally, why the red color appears abruptly and can differ or disappear (as rhodoxanthin is cleared from a bird’s system, the color fades). The feather color is affected by when the berries are ingested and how many are eaten. Hudon’s team thinks that rhodoxanthin may cause color changes in other birds too—and have consequences on their love lives. While yellow-shafted and red-shafted flickers frequently mate with each other and pay no mind to color, many other species use feather color to identify and assess potential mates. For these birds, a meal that changes their hue could lead to problems finding a partner. Though their feathers might be red, they could be left feeling blue.